What is the flying time to Johannesburg? What African country has coastlines on two oceans? Where can you visit the Omo tribe? It is a pleasure to avail this New year opportunity to wish you and your team a very happy new year 2010. May the Almighty shower on you blessing, health, prosperity and success for yor remarkable work of Africa tourism promotion. Our magazine Africa Travel has gained momentum and reached new heights through your endeavours , expertise and professionalism. You may have forgotten me or lost sight on who I am. Just simply remember Mr RADJI Raoufou, the gentleman who served as Assistant Director of Tourism and Interpreter Translator during the ever successful 22nd ATA International Congress in Cotonou in May 19997. I kept very good souvenir from both of you but unfortunately my present position of lecturer in Tourism English as well as Conference Interpreter and Deputy Director of the National Directorate of Interpreting and Translation in the Benin Ministry of Foreign Affairs and African Integration does not offer me much time to entertain with you as often as I would have wished . You would also remember that some three years ago i resumed connection with you and you had been very kind to send me two latest issues of your wonderful Magazine i would never forget. I do hope that time has come for me to renew the contact and resume interaction with you. For the time being, i wish you all the best . Looking forward to hearing from you soon and receiving your latest issues to help me redive in your outstanding reports, analysis and pictures. Thanks in advance. For Muguette; Bonne année Madame et du courage, j'ai hate de vous lire et d'avoir de vos nouvelles, A bientôt. Since my email to you, I found another source, an Africanist Dr. Kevin MacDonald, who also responded.Coincidentally he is preparing an article on Marie-Therese Coincoin but it is not expected to be published before the end of summer. However, he did indicate that Marie-Therese was not taken from Togo but more likely from the Gabon-Congo-Angola region. He has agreed to send me a copy of the published article. Consequently I probably will not be visiting Togo in preference for whatever African state that Dr. MacDonald indicates would be the more likely choice. Regardless, I thank you for replying and would certainly accept any info you feel would be pertinent and supporting. And in case you are interested, Dr. MacDonald is connected with the University College of London, Institute of Archaeology. I travel quite a lot but have not yet visited Africa. I am sure that I will be contacting you for your valued opinions on what are some interesting and safe African countries to visit in addition to my heritage related country. Dear Jerry and Muguette. My 6 day trip to Whistler, BC, earlier this month took me to the Adventure Travel Trade Association's annual Summit conference. Yes, the ultra cool mountain ski village is beautiful in the fall, and a great relaxing place for a meeting. I attended the meeting to learn more about the growing niche market of Adventure Travel & to make job contacts there. Attendees included tour operators, travel agency specialists and travel media from all over the world. The weather was typical mountain fall, including rain, mist, fog, sunshine, and even a few great views of the nearby mountain peeks. I stayed at the Pan Pacific Mountainside hotel, about a minute away from the gondola to the top of the extremely steep mountain. The hotel gets rave reviews & high stats as a resort from publications like Conde Naste. We got really good rates as association members. My hotel included an Irish bar with lots of good music, Irish & folk, sung by Guitar Doug. Whenever Doug asked if everybody was tired yet, the crowd enthusiastically yelled, "No!! ", so he kept on singing. The halibut, salmon & corn beef was delicious. Since the bar got some bad beer kegs, the usually great tap beers, Harp & Molson, were not available. Eeeeeeekkkkkkk! I spent every night in the cozy Irish pub, with a nice warm fireplace, before going to bed. We had 3 nights of entertainment & specialty foods at the conference including a Canadian night & Alps night (featuring France, Germany, Italy & Switzerland). My favorite party was hosted by Brazil, which included a fabulous Samba band & dancers. The conference was held at the convention center located in the Village Stroll area, about a 10 minute walk through the picturesque town. From India: (In reponse to an airline scam we uncovered on his behalf). Could you send me more information about the cultural and wildlife tours in Nigeria? I intend visiting Nigeria for a conference in July 2008 and would like to plan a trip for perhaps a week before or after the conference, which is being held 8-11 July at Lagos, for myself and my partner. My main interests are in the people and wildlife (particularly birds), and my partner just loves to travel. 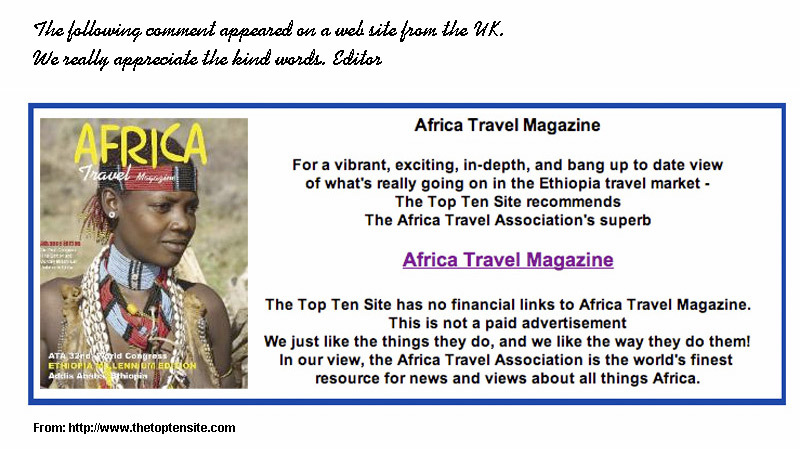 From USA: I would like to thank you for the beautifully picture you posted about the studenst in the website and Africa Travel magazine, and all the wonderfully advice you shared with us as world travel editor. Just a reminder , my name is Johanne Briere (red shirt in the picture), I help initiate and organized the student trip to Nigeria last November. Seeing as your and Miguette put all these beautifully story about Nigeria. Seed Capital for Investment in an African Tourism Project? A reader recently asked the above question, which we then posed to our friends and gurus at Google. Like us, you will be pleasantly surprised with the comprehensive list of sources we received on this quick search. Click for sample list.. Do you have any further sources? Please send a letter to our Business Page Editor. From the British Isles: "Your publication has so far been one of the best sources of information on this topic that I've come across." Phillip T. Slattery, Economic Section, US Embassy - London. From London, UK: Dear Muguette Goufrani. Your latest contribution to Africa travel Magazine (on-line) was very informative, wonderful and positive to the struggle that African fashion has always been. You placed African fashion on that beautiful and respectable place that it rightly deserves. Even though I am male I see beauty in our woman and derive loads of pleasure from the development of our people. Thank you for being a great African.. David Moloteni. From Ghana: Thanks a lot for the good words about my dear country and Africa in general and we thank God for people like you who at least see the positive side of the continent. God richly Bless you. Thanks a lot for your kindness too - the lots of gifts given out to people, that was so touching and moving. I will definitely check the website out for more pictures and stories about my country. I am so glad you enjoyed the tour and all the info I am sure will be on the net soon, I suppose. I pray to God to give you continuous good health and kindness at heart. Take care and thanks again. Rejoice. From Madagascar: I have founded a company in Madagascar to encourage tourism specific to the amazing gemstone industry present there. I am based in Michigan in the States and Antananarivo, Madagascar with full time staff.We will host at least 4 tours in 2006 April and August.. James Fiebie http://www.gemstonetrips.com. Dear Jerry: It will be a pleasure to tell our readers about your centre. Diana Reef Resort and Spa. "Our post tour to Mombasa was exquisite. Six of us traveled there after the ATA Conference in Nairobi, and what a treat. The resort is luxurious, from the minute you enter the lobby, of which the floor is an aquarium. The rooms were beautiful, the food outstanding and the spa trreatments were absolutgely wonderful. We toured Fort Jesus and did a city tour of Mombasa, which was both informative and interesting. It's always good to learn as much as possib lle about each African destination. Everyone was pleased with our experiences in both Nairobi and Mombasa. The conference was one of the best to date."